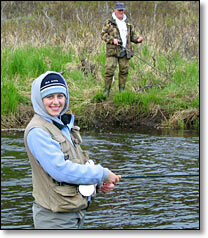 Homer Alaska and Lower Kenai Peninsula guided stream fishing on the Anchor River, Ninilchik River, Kasilof River, Deep Creek and Homer Spit lagoon. Fishing king salmon, silver salmon, red salmon, trout and steelhead. All prices are per person, and include tax. To reserve a desired day or days, a 50% deposit sent by check to Silverfin Guide Service is required. The remaining balance is due on the day of fishing. We will help determine the best time and place to maximize your catch, and would be happy to discuss any questions or concerns you may have. On the day of fishing, you will meet us at a predetermined location, and then follow us in your vehicle or RV to the appropriate fishing area. Cancellation Policy : After making a reservation, if you cancel a month or more before your trip, your deposit will be refunded. Canceling with less notification will cause you to forfeit your deposit.